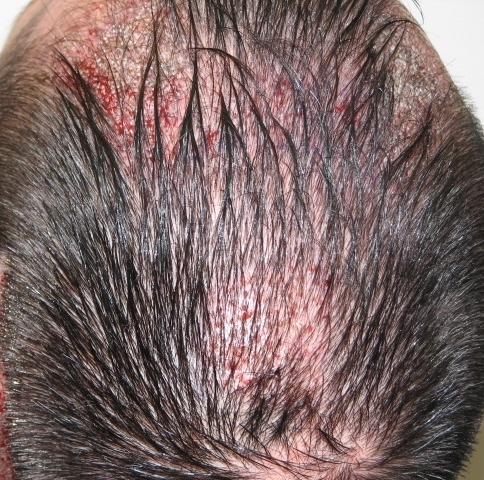 This Norwood 3 patient (potential NW 5) pursued the IHTI Brussles clinic in hopes of increasing density on the frontal hair line and fill-in a scared crown. Approximately 1700 FIT grafts were placed on the front and 300 grafts on the crown. Placement onto the crown requires extreme precision due to the fact that it is a vertical plane and bears an illusion of low density. Grafting into a crown normally requires more donor hair to cover than any other recipient region on the scalp mostly because of the natural angles involved. 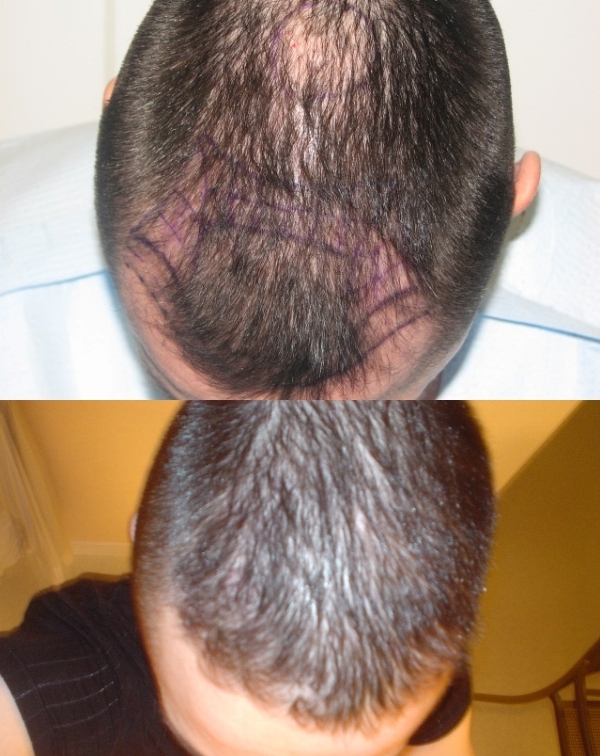 Since surgery in March of 2007, this patient has been utilizing Hair Cycle, an all natural hair product that promotes longer life of scalp hair. Below are images of his current progress after just 7 months post-op. We are excited for this patient and overwhelmed with another successfully treated case. wow, now that’s a natural hairline, very nice. Nice hairline.Very nice result for 1700 grafts. I like how the doctor has boxes drawn before surgery, Im guessing its 1 square cm (or 1 square inch?) for calculating how many grafts to put. Is that correct? Do you have immediate post- op pics ? This has to be the best hairline work I have seen for only 1700 grafts. Do you have more pictures of the hairline or front? » you have more pictures of the hairline or front? This is amazing work for only 1700 grafts. The hairline is very natural. Hard to beieve you got that out of less than 2000 grafts but indeed it looks very good… by the way, whats this haircycle, shampoo, lotion? ONce you read it twice, one does not know whether the result was due to the surgery or the after care product… Please explain. » another successfully treated case. This is better than Dr. Wolf’s 1500 FUE, I thought that was one of the best. Can we see more hairline pics ? There is only 1 in the post. » inch?) for calculating how many grafts to put. Is that correct? » Do you have immediate post- op pics ? Yes it is.We will try to get them for you. 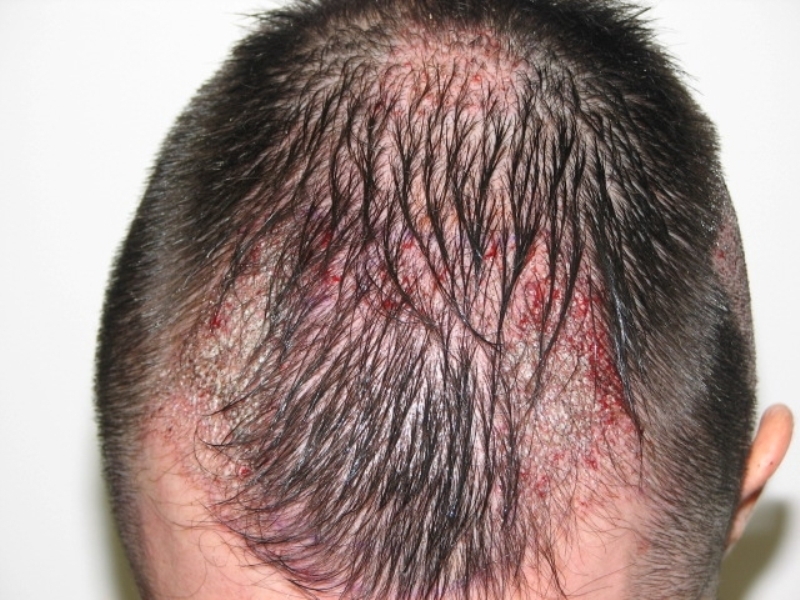 » Hair transplant surgery is not only grafting hairs from the donor to the recipient area.That technical part must be integrated in the hair care which include medical therapy (propecia,rogaine,and vitamins).Products such as hair cycle have been tremendous in the healing process of our patients.My goal was to use medications and hair cycle withsmall grafts as a starter in the crown treatment by placing strategically the grafts. In front,I used one of the advantage of FIT ie you can get a high calculated density (numbers of hairs per graft);so for those 1700 grafts,you got pretty much 5000 hairs displaced,which explained the good coverage. Congratulations to the patient and Dr. Mwamba at IHTI Belgium! Dr. Mwamba focuses on treating hair loss as a whole, not just performing surgery. 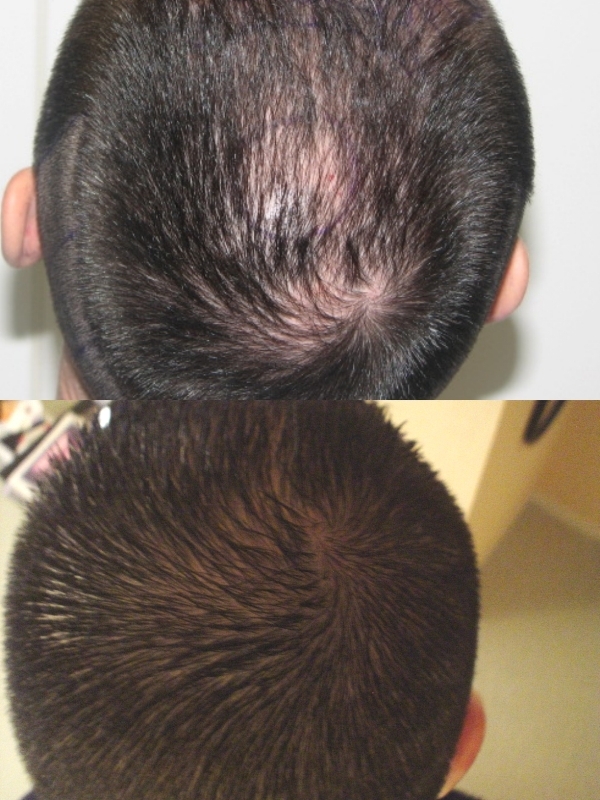 Based on the consultation with this patient, Dr. Mwamba recommended Rogaine, Propecia, and HairCycle as well as a conservative 1700 grafts to the hair line. As the patient was just beginning to see some thinning in the crown area, Dr. Mwamba strategically placed 300 FIT grafts to the crown. By using a combination of treatments and meticulous placement of each FIT graft, the patient can enjoy a lower number of grafts and less expense. Do I understand correct then that you are saying that 1700 grafts got almost 5000 hairs? so an average of almost 3 hairs per follicular unit? I thought the average was about 2.2 hairs. So, two things, did you place any hairs on the hair line because I though only single hairs were used on the hairline, and if you can get so many hairs in a small amount of grafts does that mean you are not taking natural groups but larger amounts in one punch; for example a 1mm plus punch could remove say two 2 hair follicular units at the same time; so that way the graft number is lower but the hair number is higher?? But then of course the size of the punch must be larger too. Very nice but do you have more hair line shots ? Hard to be convincing with just 1 pic. 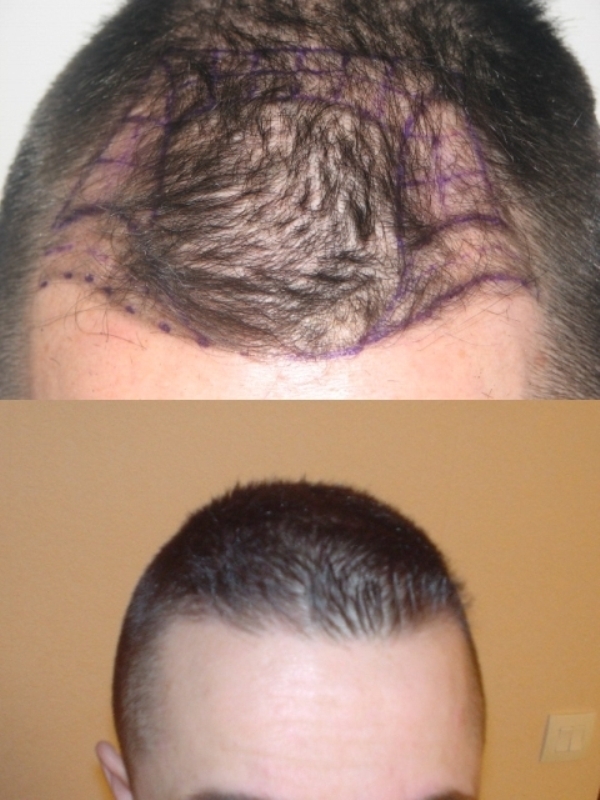 Below are immediate post-op photos and another image of the frontal hair line done by Dr. Mwamba of IHTI Brussels. » » just 1 pic. » line done by Dr. Mwamba of IHTI Brussels. How can anyone say this is a natural hairline ? Are you looking at different pictures to me ? The hairline looks completely, 100% UNNATURAL ! 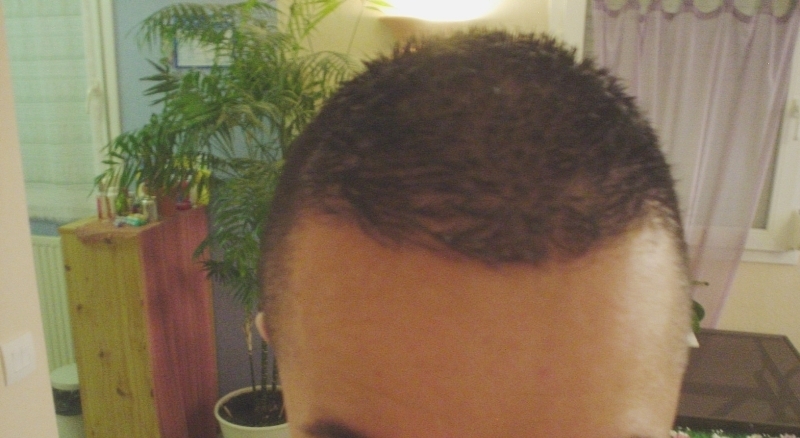 In the ONLY half decent shot out of these very poor and inconclusive pictures, his hairline is pointing…BACKWARDS ! Yes, its probably slicked back i know, but the point is that based on this hairline pic there is no way anyone can say its natural and congratulate him. What we need to see is a decent shot of the hairline which clearly shows the angle of transplanted to see if its natural or not. Dr Mwamba, do you have any better pics of his hairline please ? Its hairline work i am interested in and am considering visiting Dr Cole or yourself…but i need to see HAIRLINE results. » How can anyone say this is a natural hairline ? » Are you looking at different pictures to me ? » The hairline looks completely, 100% UNNATURAL ! » pictures, his hairline is pointing…BACKWARDS ! » the angle of transplanted to see if its natural or not. » Dr Mwamba, do you have any better pics of his hairline please ? » or yourself…but i need to see HAIRLINE results. Col, I feel the same. Well, it’s not unnatural but I am just not as impressed after seeing the 2nd hairline pic. It would be nice if there are more pics to see. I can’t conclude, it’s really not bad but it’s really not as impressive as I thought it was either.